Parameters are useful when you want to add interactivity and flexibility to a report, or to experiment with what-if scenarios. Suppose you are unsure which fields to include in your view or which layout would work best for your viewers. You can incorporate parameters into your view to let viewers choose how they want to look at the data. They need to be used in calculations. The parameter control needs to be displayed so that viewers can interact with it. Before you begin, decide which fields you want to make interactive. For example, you could allow users to view the categories within a dimension by color, or to view sales data over a period of time that they choose, and so on. The example described here sets up a table for which users can select the dimensions to display in the columns and rows. These steps use the Superstore sample to create a new parameter while you build the calculated field that will take advantage of it. In the Calculated Field dialog box, for Name, type Column 1 Category. Name the parameter appropriately so that viewers can tell what changing it will do. This example uses Select Column 1 Heading. For Allowable Values, select List, type None as the first value in the list, and then press Enter. Complete the list by typing the names of the additional dimension fields that you want to expose through the parameter. Note: This example uses the customer name, customer segment, region, department, and category fields. These are all dimensions of the same data type (string). If you wanted to include a measure such as profit in this list, one option would be to convert the measure to a string value. You would do this when you build the calculated field, using the STR() function. This article covers only the single data type scenario. The Display As aliases default to the field name, and for this exercise you can leave them as they are. Click OK to return to the Calculated Field dialog box. Tip: Instead of typing each value in the list, click Add from Parameter to add them from Select Column 1 Heading. Note: ELSE accounts for the None value that you included in the parameter, and it returns an empty string. The basic formula for each calculated field is the same as in the previous step, except that you reference a different parameter in each CASEstatement. Next, expose the parameter control so users can select the categories they want to display. 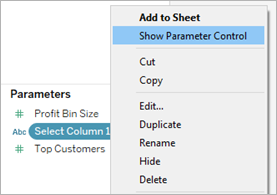 In the Parameters pane, right-click the parameter and select Show Parameter Control. 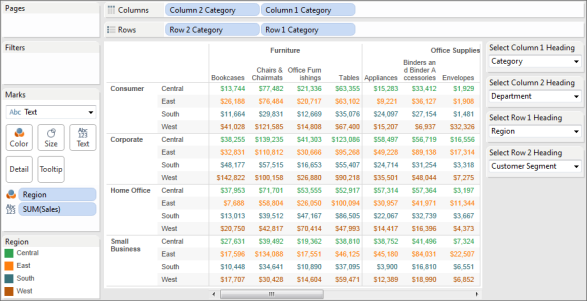 From the Dimensions pane, drag the calculated fields you created to the Columns and Rows shelves. From the Measures pane, drag a measure to the view. In this example, Sales is placed on Label on the Marks card. Test your parameters by selecting fields in the parameter controls. Sort the dynamic dimension fields alphabetically. Hide field labels for rows and columns. 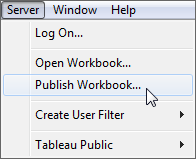 Reset all parameters to None and publish the workbook to Tableau Server. Viewers can set up their own reports, save their parameter settings, and share views with others. For information about building views dynamically, see Swap Measures Using Parameters. For information about the different areas in the Tableau interface in which you can create and incorporate parameters, see Create Parameters and its related topics in the Tableau Help. Disclaimer: This topic includes information about parameters from a third-party blog, The Information Lab: Data School. Please note that while we make every effort to keep references to third-party content accurate, the information we provide here might change without notice as content on The Information Lab: Data School changes. For the most up-to-date information, please consult The Information Lab: Data School blog.